New baby? Old family traditions? I have always been fascinated by cultural differences around birthing – and of course those differences continue into raising our children. But even within similar cultures – we often see a huge variety of “family traditions” – especially at Christmas time. I asked our coffee group mums whether they might be continuing an old family way of doing things, or if they were intending to introduce new ideas for their own families – and here are just a few we heard about. Looking for the Christmas star – one of our mums is Polish and she explained that Christmas eve is very special for the family and everyone gets dressed up for the evening meal – but no one eats anything until the first star has been spotted – so the kids all go out and look for the first star as night falls!! What a magical way to start the festivities. Mince pies and whisky / baileys / hot chocolate left for Santa on Christmas eve. So the old ones are the best – I especially like this one as I always get to nibble the pie and wash it down with whatever “snifter” we have chosen that year. It beats me that the kids find it acceptable for Santa to drink and drive, but I guess a police car would find it tricky to catch Rudolph! Reindeer glitter – take a small cup of oats, mix it up with some glitter and put it in a christmas bag to put in your Christmas eve box (see further down) – for your little ones to sprinkle outside the house – the glitter lights the way for the reindeer and the oats provide a nibble for them whilst Santa is inside getting riddled on the “snifter” ! Christmas eve boxes – an old shoe box, filled with hot chocolate, marshmallows, DVD, Reindeer glitter, new Pyjamas and a pair of slippers – opened early evening for them to get changed into and settled down to watch a movie with you. I had never heard of this but think it is such a cute idea that can be enjoyed with the smallest of children. NORAD – Now this one is a great way to encourage your little ones to bed on Christmas eve. NORAD online tracks Santas journey across the world in real time – so as soon as he is in Western Europe my kids scuttle off to bed. They know that Santa only has time for one fly past, and if they are awake then he simply can’t come into our home and risk being seen by them. “Ho Ho Ho” says mummy when she gets an early evening of peace and quiet. This year NORAD have a whole new website to explore before christmas with a countdown to the day and loads of games and things to read. Topping the christmas tree – this has been our festive tradition for the past 21 years. Since I had my beautiful daughter Ellie she has been asked to finish off our tree decorating by placing the angel at the top. Obviously I had to help her just a little bit in the first two years, but she soon got the hang of it! 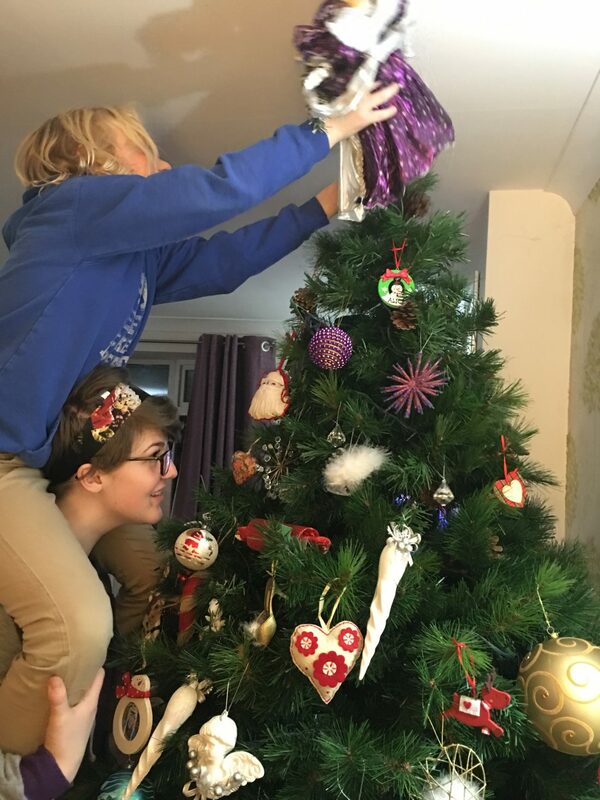 This year she still returned from Uni for just a few hours to help me decorate the tree and to put the “new” fairy at the top (the fairy is actually 16 years old now – but will be forever called the “new” fairy). She kindly shares the job now with her smallest brother who she has to help reach up – but every year we get a new picture to add to the album, and its a lovely snapshot of how they are growing so quickly – measured by their height against the tree! Tell us about your family traditions – how long have you been doing them and how did they get started? Share the post "Christmas traditions for families"